If I had to go back and do it all over again, I'd probably be an ethnobotanist. Oh sure, the career path is a bit more limited, and I probably would have tired of plants after a bit, but something about tying together history, culture, and ecology gets me really jazzed. The field of ethnobotany examines the relationship between plants and people, situating plants within societies and humans within ecosystems. But we're not talking about just any botany; it's the stuff we end up eating that is fascinating. 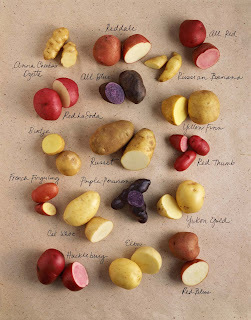 Ok, so according to the International Potato Center, a potato (Solanum tuberosum) – part of the nightshade family along with eggplant and tomatoes - is a species native to the Andean region of South America composed of 4,500 varieties and consumed by people for about 10,000 years. Now in third place in terms of crops of global importance for human consumption (and more limited to a small subset of this vast gene pool), this genetic diversity and cultural, climatic, and ecological specificity persist in the Andean heart. It's not all sunshine and roses, though, and potatoes proved to be front and centre of such tragedies as the Great Famine in Ireland - in which the monochromatic landscape of 'lumper' potatoes presented fertile ground for a devastating fungal blight. Now sweet potato is a separate genus (Ipomeoea batatas) – hailing from the morning-glory family – but is also from Latin America. Contrary to my initial understanding, it is not a tuber (a thickened stem) but a “storage root”. It was one of the big botanical travelers, probably hitching a ride with Polynesian sailors to the Pacific Islands. Eventually it hit Japan and radiated throughout Asia. High in vitamin A, the sweet potato has more recently found itself a favourite staple introduced to Africa for nutritional improvement. And while batata (one of its names) may sound similar to patata, the sweet potato is most definitely not. Taro, a not particularly notable-looking tuber, also belongs to another genus (Colocasia esculenta), although in some languages it is called a type of ‘potato’ (e.g. itchy potato in Vietnamese and village potato in Japanese). Thought to have originated in South Asia (India, Nepal, Bangladesh), taro has spread widely throughout Oceania and the Pacific, embedding itself in culture and tradition. For instance, Hawa'iian folklore has the ancestral human and the first seed of taro as siblings, borne of the sky father and earth mother. Deceptively plain from the outside, sweet potatoes as art! Finally, yams - no not those deep orange gems eaten at Thanksgiving - are also from a different genus (Dioscorea, spp) and are indigenous to West Africa (although one species originated in Asia). After cassava, it is the most cultivated root/tuber crop in Africa. A central part of people's diets for upwards of 10,000 years, yams have also found their place as symbols for marriage and fertility. And if you're around Ghana or Nigeria next month, there is a 'Yam Festival' in celebration of the rainy season ending and the harvest commencing. Botanically speaking, these four are all very different; my purple sweet potato is not a taro or a yam, or I guess even a potato for that matter. But I suppose culturally, they have similar preparations and culinary manifestations as a result of common characteristics as starchy staples. The astounding thing is how far each has travelled, and how non-native crops have immersed themselves so thoroughly that they become invaluable, pivotal in traditions and diets, and imbued with their own local significance and names.